If you can boil water, you can make this yummy dish! 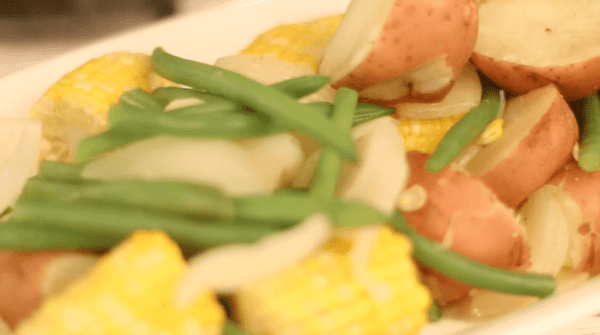 This veggie boil recipe is ridiculously easy. If you can boil water, you can make this dish! The trick is adding the vegetables in the correct order so they can each cook the appropriate amount of time. A well-cooked vegetable is a delicious vegetable! To make this veggie boil, you’ll start by filling a pot about 3/4 of the way full with water. Next, add about a tablespoon of Old Bay Seasoning. We all know Old Bay is great on seafood, but it’s also great on veggies. It packs a serious flavor punch and is the only seasoning this recipe requires. Now it’s time to get boiling. First, add the potatoes. Any potato will do but we like red or new potatoes for this recipe. The potatoes will boil for 10 minutes on their own and then you’ll add the green beans and onions. After 5 minutes, you’ll add the corn on the cob. Once the corn is in, boil for another 3 minutes. That’s it! Now you have a mix of perfectly cooked vegetables that can accompany any meat or seafood of your choosing. Add Old Bay Seasoning and potatoes to a large pot and boil for 10 minutes. Add green beans and onions and boil another 5 minutes. Add corn on the cob and boil another 3 minutes. Scoop vegetables out of the water with a strainer and serve hot. Did you try this recipe? Share your feedback in the comments below.